Located just north of Burbank & only 20 minutes from downtown Los Angeles, Paradise Ranch is a Luxury Pet Resort, where pets enjoy Cage-Free Boarding, Doggie Day Care, Dog Training & Grooming. That’s what Paradise Ranch is all about. Other dog resorts that claim to be cage-free only allow limited play time and then lock dogs into private rooms alone. Dogs feel stress in any kind of solitary confinement (even in a fancy suite) and don’t find this kind of boarding nearly as enriching, and that’s why Paradise Ranch doesn’t do it, although it would be easier, less costly, and, frankly, more profitable. If you are thinking about boarding a dog then you should check us out because when it comes to boarding dogs we are simply the best choice. We are the first fully-licensed cage-free dog boarding facility in the United States & the originator of the cage-free dog boarding concept! We are much more than a dog boarding kennel, and much more than a dog hotel, and are actually a full-featured dog resort. 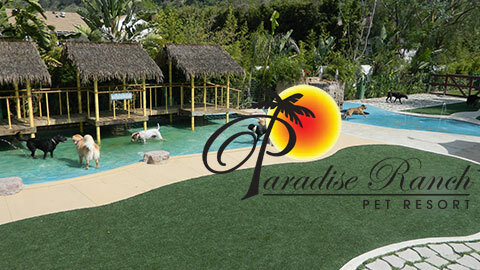 Paradise Ranch Pet Resort will give your canine companion the best dog day care, doggie boarding, and/or dog training experience, and we do it in a first-class “Resort Style”. You can witness it in our photos and videos, plus you’ll experience it person when you take our tour. We are truly a luxury dog boarding and dog daycare facility. And we have a dog water park! We have the highest staff-to-dog ratio anywhere. Our style of cage-free canine boarding requires more effort, but it’s worth it, because your pet is NEVER locked up! Other Pet Resorts, Dog Hotels, Dog Kennels, and even Pet Sitters all use “confinement” of some form, but not Paradise Ranch Pet Resort! And we do all this at rates that are comparable to or less than our competitors. If you are looking for dog services in Los Angeles, then you’ve found the right spot. Another element of our Enrichment Program at Paradise Ranch is the familiarity of our true-home environment style of canine boarding for dogs 24 hours a day. Dogs prefer a real home and outdoor play yards over a kennel or a warehouse. Every dog spends their days playing outdoors in cage-free yards and their nights sleeping in real homes with real bedrooms, and every minute of it with canine and human companionship. We serve the entire Los Angeles area and are close to Burbank and the San Fernando Valley. Whether it is pet daycare, doggy boarding, canine training, or a dog water park that you want, we’ve got it. We may not have the dog whisperer, but we do have the finest canine training programs available. Our dog trainers know how to turn your canine companion into the perfect canine citizen, and the benefit to you and your pooch will last a lifetime. With many different dog training programs to choose from, our dog trainers will evaluate your pet’s needs and recommend the right dog training program to get your dog’s behavior to that place where you will both be happier for years to come. © 2013 Paradise Ranch Pet Resort. All Rights Reserved.